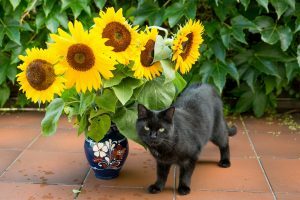 Is Your Cat At Risk For Kidney Failure? Could I have Kidney Disease? Chronic renal failure in cats is also known as chronic kidney disease, kidney failure, or chronic renal insufficiency. It refers to a degeneration of the kidneys that has been progressing over a period of months or years. The damage to the kidneys is irreversible and although there is no cure, supportive treatment can delay the progression of disease to increase the quality of life for the elderly feline. Kidney damage in cats occurs when the kidneys ability to function and remove waste products from the blood is impaired. Chronic renal failure refers to damage that has occurred over a course of weeks, months, or years resulting in inflammation and non-functional scar tissue. Alongside a full history and veterinary examination, common pathways in the diagnosis of chronic renal failure in cats include blood tests, urinalysis, and diagnostic imaging. Physical examination may reveal dehydration, enlarged lymph nodes, signs of anemia such as pale mucous membranes, and dilated pupils. The veterinarian will also palpate the abdomen to feel for kidney abnormalities such as nodules or irregular sizing. Blood tests are performed to determine abnormalities related to renal failure along with any complications that have developed due to decreased kidney function. Blood values assessed include blood urea nitrogen, creatnine, phosphorus, amylase, and a red blood cell count. The urinalysis is a complete assessment of urine components. Kidneys play an important role in the dilution and concentration of urine. Cats with chronic renal failure often have dilute urine along with excess protein in the urine. The urine sediment will also be examined under a microscope to look for the presence of cast cells associated with renal failure. Diagnostic imaging may involve radiographic or ultrasound evaluation of the kidneys. Radiographs are useful in visualizing the kidneys, checking for calcification associated with renal failure, and assessing the urinary system for stones. Ultrasonography is more sensitive and helps to determine the size and internal anatomy of the kidneys. Initial treatment is aimed at supportive therapy in order to stabilize the cat’s overall condition and correct dehydration as well as electrolyte imbalances. There is no cure for chronic renal failure in cats. After initial stabilization and therapy, treatment is aimed at prolonging kidney function and increasing the quality of life. The aim is to reduce the workload on the kidneys, replace electrolytes that are lacking, and to decrease the accumulation of waste materials. Ongoing treatment involves a combination of life-long medications and dietary management in order to counteract symptoms of renal failure and slow the progress of disease. Kidney transplantation is available at specialized veterinary universities, however it is not commonly performed to due to the high cost and risk of complications. Even after a kidney transplant, cats need to be kept on life-long medications and immuno-suppressive therapy. Ongoing monitoring of renal failure is vital for monitoring the progression of disease and ongoing quality of life. Cats that have been diagnosed with chronic renal failure should be reassessed by the veterinarian every 3 – 6 months including a blood panel and urinalysis. Chronic renal failure in cats has a guarded prognosis, but with early diagnosis an effective management plan can be formulated to slow disease progression. Although there is no cure or preventative treatment against kidney disease, there are a few steps owners can take to slow the process of damage. Overall health plays a crucial role in a cat’s predisposition for chronic renal failure. Cats should be kept in good health and treated promptly for any disease or infections. Yearly veterinary check ups should include vaccinations and dental scale and polishing if needed. 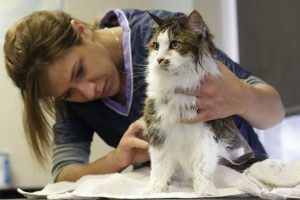 Senior cats over the age of eight will benefit from a yearly screening involving blood and urine tests. Water is the ONE absolute thing you can do to help the kidneys function best. Cats are easily dehydrated. when cats are dehydrated it makes the kidneys work harder to flush their systems. Feeding dry food further dehydrates your cat. Feed 90-100% moist canned food. Ultimately, feeding at least twice a day of approximately 3 ounces of canned food at each time will help. Adding 1/4 cup more water to each meal, will also help. See our article on Feeding Cats by Gus Bennett to learn more. As toxins are filtered through the kidneys, exposure to toxic substances should be limited. Toxins include antifreeze, lilies and other plants, grapes and raisins, diets consisting solely of fish, and over-use of certain medications. Owners should be aware of possible genetic connections to chronic renal failure in cats. Breeds such as Persians and Abyssinians have an increased prevalence of chronic renal failure. It is important to be aware of the clinical signs of renal failure as listed above and seek prompt veterinary diagnosis and treatment. Ongoing management and monitoring will play a vital role in delaying the progression of chronic kidney disease and increasing a cat’s overall quality of life. We love our pets, and want only the best for them, but sometimes the best seems to be financially out of reach. Between fulfilling a pet’s nutritional needs, vet care, medication, grooming, and other costs associated with caring for a furry companion, it can be quite expensive. And what happens in the event of a medical emergency when your pet’s care may mean the difference between life and death? Obviously, you want to do what’s best for your canine or kitty companion, but what if you simply can’t afford it? Pet Insurance. Annual exams and vaccinations are a must for any pet, but when accidents and illness come into play, veterinary costs can skyrocket. Consider a health insurance policy for your pet. Many pet parents steer clear because the assumption is that pet insurance is expensive, but in reality, it can be quite affordable, with the average policy starting at $32 per month for a dog and $22 per month for a cat. Of course, your pet’s breed, your location and other factors are considered when rates are determined, but it doesn’t hurt to check out what’s available. Visit Pet Insurance Review to find out which plans could benefit you and your pet and to compare plans and prices from multiple providers. In-house Labs and Discounts. Another way to save money on veterinary costs is to ask for in-house labs (done at the vet’s office, not shipped elsewhere). Also, be on the lookout for annual health packages such as senior wellness or puppy health packages. Many veterinary clinics offer these types of packages but don’t always advertise them. As well, many clinics offer seasonal discounts based on pet awareness months. For example, February is Spay/Neuter Awareness Month, so many vets provide discounted spay and neuter services during that month. Credit / Financial Aid. In the event of an unforeseen emergency, such as an accident or necessary surgery, there is a credit card available for use at your veterinarian’s office. CareCredit is accepted by over 175,000 providers across the country, including veterinarians. With an interest rate less than 15% and fixed monthly payment amounts, your CareCredit account can be used as payment for everything from routine wellness exams to surgical procedures. The company even offers interest-free charges if paid in full within a certain time period. CareCredit may be something to consider if you don’t have an emergency fund available for your pet’s care. As well, groups like IMOM and RedRover allow you to apply for financial aid if you can’t afford veterinary care for your pet. There are also several national and state resources available, as well as veterinary schools, for pet parents who can’t afford necessary medical treatment for their precious pet. Check out the list of these schools and organizations, with corresponding links to their sites, on the American Humane Society’s site. Negotiate. Finally, if you find yourself needing financial assistance in order to properly care for your pet, your veterinarian may be willing to assist. If you’re a client in good standing, your vet may be willing to work out a payment plan so that you don’t have to come up with the entire amount needed at once. You can even offer to barter a bit, providing much needed services such as kennel cleaning, answering phones, or helping with other tasks of which the pay can go toward your bill. It’s inevitable. At some time or another, every pet will require some type of medication, whether it’s heartworm preventatives or antibiotics. Always request generic brands, when available; they provide the same benefit as the name-brand medications, but at a fraction of the cost. And remember, you don’t always have to purchase prescription medication from your vet, where the mark-up can sometimes be 100%! Use apps and websites like GoodRX and LowestMed to compare prices at your local pharmacies (these apps are great for people, too!). It can happen to any pet ~ an illness, disease, accident… You’ve always managed to provide your pet with the medical care she needs and deserves. In the event you are faced with veterinary expenses that seem out of reach, take some comfort in knowing there are ways to get a grasp on them! 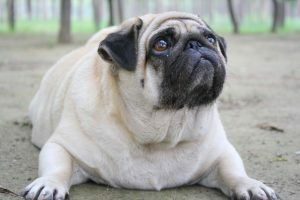 In a previous post, we discussed the problem of increased occurrences of lyme disease in dogs, but there’s an even bigger threat on the horizon – the growing prevalence of obesity in our companion pets. According to recent figures released by the APOP (Association for Pet Obesity Prevention), around 53% of dogs and a whopping 58% of cats are considered overweight or obese in the United States. Depending on their particular breed, like a Shar Pie for example, you should be able to feel their ribs, not so much that they’re emaciated, but they shouldn’t be concealed from your touch. ● Limit their food intake and don’t leave an “open buffet” of kibble laying around. ● Cut down on treats, depending on their size, one or two a day is sufficient. ● Stick to an exercise schedule. While many people will walk their dog daily, some cat owners forget that their felines also need to remain active. While walking them on a lead may not be an option, you can still exercise them in other ways to increase their activity levels. Anything from a high-tech laser pointer they’ll chase around the house to leaving some bags and boxes around for their enjoyment. Be creative when it comes to getting your cat off the couch. Overfeeding our animals is the leading cause of them becoming overweight or obese. By pampering them with too many treats and not ensuring they’re active and exercised properly, we’re literally killing them with kindness. Before giving them that extra treat in a moment of wanting to see some instant gratification, think about their long term health instead. Feeding them less today will ensure they’ll see more tomorrows with us in the future. Perhaps you’ve heard news stories about pet sitters accused of stealing from their clients. You may have even heard the recent news story about a Memphis cat sitter charged with stealing more than $10,000 worth of jewelry from her client’s home. According to police, clients of Lisa Bacon began locking their valuables inside a closet as they were beginning to suspect items were being removed from their home while Ms. Bacon was cat sitting for them. The couple installed video cameras in their home and were shocked and dismayed to find their trusted cat-sitter bypass the lock on their closet and rummage through their belongings. 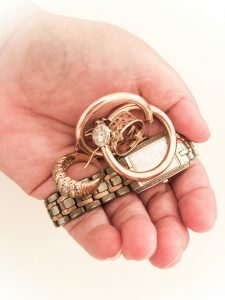 When confronted by police, Ms. Bacon admitted she did indeed steal the jewelry, but claimed she threw it away after receiving a phone call about the theft complaint. So, how do you know you’re trusting your pets and home to the right person when you’re away? Are there precautionary measures you can take to ensure someone like Lisa Bacon won’t be welcomed into your home? Can you be confident your pet sitter is as loyal and honorable as you hope? All it takes is a little research to lessen your chances of being the victim to someone like Lisa Bacon. During your search for a trustworthy, dependable, caring pet sitter, recognize the difference between a hobbyist and a professional. First off, understand that a hobbyist is a person who is engaged in pet sitting in his or her spare time, while a pet sitting professional is an expert who has made pet sitting his or her career. The daughter of your neighbor from down the block who offers to pet sit for you on weekends is a hobbyist, as is the lady who holds a full-time job at your local grocery store but pet sits on her days off. On the other hand, someone who has a licensed company and likely other pet sitters on the payroll is a professional. Take a cue from your dog and do some digging when it comes to choosing a pet sitter. In instances like this, the internet is your best friend. Conduct Google searches, read customer reviews, check out Facebook pages, carefully investigate websites, etc. Make sure the person you select to care for your precious pets works for a bonded, licensed and insured professional company. These three things will protect your pets as well as your home and belongings. Is this Pet Sitter a legal Business in Your State? If you are okay with just anyone caring for your pets or home, then you may not care. But if anything happens, you may not have a legal leg to stand on. Contact your state department or look online to see if a business is registered with the state. In NH, my business name is registered and my logo is trademarked. Why? Because this is a person who is serious about taking care of your pets. They are not just a person who wants to pet sit today and be one tomorrow. they have put in time, money and effort to be a business. So how does this BENEFIT YOU and your Pets? They have done their research, they have educated themselves, they WANT you to trust them, so you will come back and use their services later. Not just a paragraph or two. If you are going to trust your beloved pets and everything you own in your home to a person, shouldn’t you know more then just a few jobs and likes about a person? My history from the time I was born in 1961 until almost present day, is on my website. What is a listing site? A listing site is just that, it enables people to just make a listing for their services. This is similar to a newspaper classified ad section. Sites like craigslist, care, rover, dogvacay and wag. These listing sites are there to make money off of YOU and the person listing. They are TECH Sites not Pet Sites. They may even tell you that these people are insured, etc. But I have hear HORROR stories from clients who are now with us, that have used people from these sites. People who come on the first visit to pick up a check and never go back, people come home to find the sitter passed out drunk on their couch and the dog locked in the basement, and more. I have been told these sites have been sued over and over, they just banish the sitter (who goes to another site or lists under a new name) and these sites just settle out of court with payments but it certainly does not bring your beloved pet back. Why is this important? Well, Besides knowing that this business will be there when you need them (also look for a business that provides service 365 days per year – you never know when an emergency will arise and you do not want your sitter on vacation every other week if this is a hobby), a business that has been in business for years will have the experience of anything happening and have a plan in place to make sure your pets are cared for. Look for at least 5 years in business or more, why should you be their learning experience! A company that is bonded ensures the job you have hired them to do is performed and that you are protected against losses from theft or damage done by the company’s employees. In the event you, as the customer, suffer a loss due to a pet sitter who is employed by a bonded company, you can recover damages from secured money held by a bonding company. Now, if the company’s individual employees are bonded, that means a bonding company has investigated the person’s background and finds them trustworthy and “good” enough to insure. A company that is licensed has filed the necessary paperwork to the proper county, city and/or state and has been approved to conduct business. While a license does not mean the business or its employees are qualified to do a particular job, it does show intent to run a legitimate business, as opposed to a unlicensed worker who isn’t registered with any government entity. Finally, a company that is insured protects its employees should anything happen to them while on the job. For example, say Mary the pet sitter is walking down your stairs alongside your dog, Bruno, and she trips on Bruno’s tail and takes a tumble, spraining her ankle and breaking her wrist. If Mary’s company is insured, her claim will be taken care of by the insurance company, rather than her filing a claim against your homeowner’s insurance. If you’re still uncertain that the person you select to tend to your pets and home during your absence is trustworthy, look for a company that does background check on employees. Whether a pet sitter working for a company, or the friend of a friend who has agreed to stay in your home while you’re on vacation, a background check can give you peace of mind. What does Professional Pet Sitting Etc do? We at Professional Pet Sitting Etc do background checks, thorough interviews, personality tests, training, shadowing, gps tracking and so much more to give ME, the owner, peace of mind so YOU, the client will never even have to think about anything while you are away!! The bottom line is, the Lisa Bacons of the pet sitting industry can be avoided. Take the time, put forth the effort, and consider the safety nets available when choosing a pet sitter. After all, your pets, your home and your belongings are all precious to you; you don’t want to trust them to just anyone. Professional Pet Sitting Etc. is a fully licensed and insured company, employing pet sitters who are bonded, insured and have passed thorough background security checks. Hmmmm, not fond of these flowers, let me make them smell better. and How Can You Control It? As the parent of a purr-fectly pawsome cat, you may have confused urine spraying with actual urinating, even though the behaviors are quite different and represent different things. 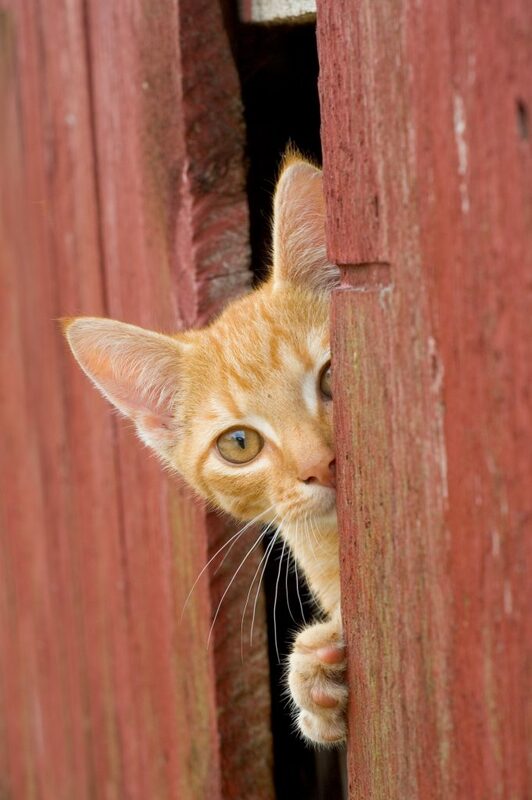 Obviously, urinating is your cat’s sanitary method of discharging urine, as it is for animals and people alike. But urine spraying is a behavior that has nothing to do with your cat’s sanitation; instead, it is a territory-marking behavior. Most commonly done by non-neutered males in a multi-cat household, urine spraying on furniture, carpet and other household surfaces is your cat’s way of saying “hey, this is my turf!” and to cover up the scent of other cats. The behavior is quite normal and natural, but it should be prevented if you want to keep a sanitary, odor-free home. First and foremost, have your kitty spayed or neutered by the time he/she is six months old, if possible. Mostcats who are “fixed” generally do not spray However, spraying can even occur with neutered males and spayed females, especially if you have waited to neuter a male cat after he has reached sexual maturity; by then, spraying may have become a fixed habit to him. Attempt to restrict your cat’s view of the outdoors. If your cat sees another cat, it is his natural response to mark his territory, which just happens to be your home. Provide your cat with a cat tree or play area to refocus his attention from the great outdoors. Foster a positive relationship amongst multiple cats. When cats get along, they are less competitive, which makes them less likely to spray. Be sure to give each cat equal attention, play with them together and encourage them to sleep and eat together. Keep a routine. Changes in your household – rearranging the furniture, moving your cat’s litter box, welcoming a new pet to the family – can create anxiety for your cat. Try to keep the status quo whenever possible by feeding kitty at the same time each day, keeping her bed and litter box in the same location at all times, engaging in playtime at a regular time, etc. If you notice your cat has a problem remaining calm and stresses easily, you may opt to try a pheromone-like spray substance that is specifically designed to help your cat keep her calm. When your cat does spray, immediately and thoroughly clean the area to prevent re-marking. Opt for a product that contains natural enzymes that will “eat” the odor-causing bacteria. Some products merely mask the scent, which is not a long-term solution. Finally, if all else fails and stopping your cat’s spraying seems like a never ending battle, try to repel your cat with unpleasant essences or experiences. There are products available that can be used to keep your pet away from areas that are his obvious favorites when it comes to spraying. For instance, Pet Safe Ssscat Cat Spray is an automated spray system that detects when your pet is in a forbidden area and releases a brisk, odorless, harmless and stainless spray that may help disrupt your cat’s undesirable spraying behavior. Another Product, Contech Stay Away does the same exact thing, but also has a warning beep first. Allowing the cat to move away before the spray of air. While your cat’s spraying is definitely a nuisance, it’s not a necessity. When you witness your cat spraying or recognize that he has, take action soon in order to achieve successful results. Pet allergies are a common occurrence affecting almost 15% of people in the United States of America. Knowing the allergy causes, symptoms, diagnosis, and treatment can help owners make an informed decision on how to live with pet allergies and coexist with their beloved pets. Allergic reactions occur when people with overly sensitive immune systems react to harmless stimulants. Contrary to popular belief, allergies are not triggered by pet fur but by proteins secreted from the skin glands. The proteins attach to dead skin cells and are commonly known as dander. Similar allergens (substances that trigger an allergic reaction) are found in animals’ saliva and urine which can collect on the fur. Cat and dog fur may also carry other allergens such as pollen or dust. Allergens can also float in the environment and collect on surfaces such as furniture where they linger for extended periods. These allergens can remain at high levels for several months even if the pet is removed from the home. All animals secrete proteins from their sebaceous (skin) glands. Pets that are described as ‘hypo-allergenic’ due to their hairless dispositions (such as Sphynx cats or Chinese crested dogs) still produce dander and can still cause allergies. They may, however, trigger less symptoms due to the lack of hair coat for dander to stick to. Dogs and cats are the most common household pets so are most commonly associated with pet allergies. Other small pets such as rabbits, rodents, or caged birds can also be allergy culprits. Allergies are most often triggered when allergens land on the mucous membranes of the nose and eyes. They can also occur when an animal scratches or licks their owner causing a localised inflammatory reaction. Airborne dander can be inhaled into the lungs causing respiratory difficulty. Diagnosis of pet allergies is based on history, clinical signs, physical examination, and allergen testing. Allergen testing involves either a skin prick or blood test to detect the allergen specific to pet dander. Allergen testing is important because although symptoms may only appear near pets, they may actually be the result of pollen or outdoor dust that the pet has carried inside on their coat. Allergen testing is not always conclusive. Doctors will often suggest eliminating exposure to pets in order to determine the correlation between allergy symptoms and pets. Removing the dog or cat from the home is often ineffective as allergens and dander can linger at high levels in the home for months. To test allergy symptoms using this theory, it may be necessary to spend an extended time away from any environments containing pets. The easiest way to reduce pet allergens and symptoms in the environment is to prevent dander and dust from building up. Build up of allergens in the environment can be prevented with the use of HEPA (“High Efficiency Particulate Air”) filters and the maintenance of ventilation and air flow. The environment should be cleaned and dusted to remove dander and pet hair. Dander can be dispersed by opening windows to let fresh air circulate and pet hair can be removed with daily vacuuming. Walls and surfaces should be dusted regularly. Bedding and blankets should be washed often. Personal health and hygiene is another important factor in reducing allergy symptoms. The stronger an individual’s immune system, the more resistant they will be to pet allergens. The immune system can be boosted by healthy eating, regular exercise, abstaining from smoking and excessive alcohol consumption, and lowering stress levels. 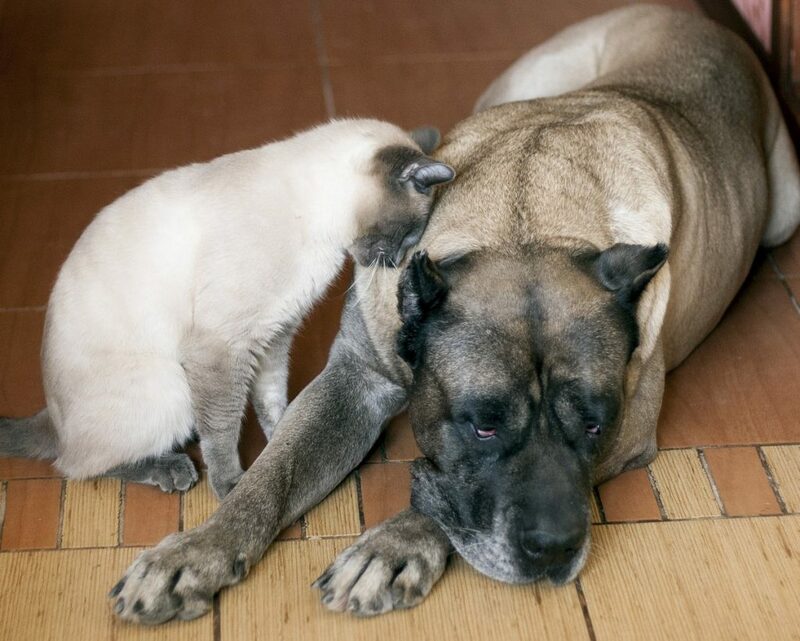 Individuals who suffer from pet allergies should practice strict hygiene after contact with their pets. Hands should be washed immediately after contact and pets should be limited from certain areas of the house such as the bedroom. There are a number of treatments and therapies targeted at helping people lessen their allergies to their pets. Over the counter or prescription medications available include antihistamines and eye drops. Homeopathic remedies are also available as an alternative to conventional treatments. Long term treatment options include allergen immunotherapy and rush immunotherapy. Immunotherapy involves a series of injections to expose the body to allergens in increasing dosages in order to decrease the body’s sensitivity. Immunotherapy works by building up tolerance or immunity to the allergens. Rush immunotherapy can speed up the initial stage of treatment by giving the beginning phase of injections every few hours instead of every few days. Patients undergoing immunotherapy will need regular allergy injection ‘boosters’ usually once per month and treatment can continue for several years. The treatment is very effective if managed well. Many people will find that their allergy symptoms in respect to their own pets will decrease over time. A combination of environmental changes and supplements or medications can help to build up a resistance to certain animals. There are definitely more options available than having to re-home your beloved pet! ASPCA – General Pet Care – Are You Allergic to Your Pet? Animal Planet – Do anti-dander pet shampoos really work? Vestibular disorders, such as Meniere’s disease and vertigo, are not unique to humans. Even our dogs and cats can be afflicted when there is irritation to the nerves that connect the vestibular (inner ear) organs to the brain. The organs provide the brain with important information about body position with respect to gravity. Sensory information from your pet’s vestibular system tells him if he is upside down, right-side up, turning, falling, accelerating, slowing down, etc. This information also coordinates with sensory information from vision and proprioception (touch sensors in the paws and other parts of your pet’s body) to help your pet maintain balance and keep a clear field of vision when moving. There are two forms of vestibular disorder – peripheral and central. Most cats and dogs are stricken with the peripheral form (inner ear), with the central form being less common but much more serious, originating inside the central nervous system (brain). What are the Signs and Symptoms of Vestibular Disorder? Signs of vestibular disease include stumbling or staggering, head tilting or shaking, falling or rolling to one side, spinning or walking in circles, or sudden motion sickness, as well as involuntary, rhythmic and jerky eye movements. Secondary signs can include nausea, vomiting and excessive drooling. Perhaps one day you notice your cat’s usual streamlined and graceful movements have become awkward and uncertain, or your dog’s love for a good game of fetch has been hampered by disorientation and lack of coordination – these can be signs of vestibular disorder. In older animals, vestibular disorder is often mistaken for a stroke, as the vertigo caused by the disorder can be especially intense, mimicking some signs of a stroke. It can also make simple activities like eating, drinking and eliminating quite difficult. In cases like this, supportive therapy in the form of IV fluids or nutritional supplements may be necessary. A pet-friendly calming agent such as chamomile or passionflower may also prove helpful, as the symptoms of vestibular disorder can be very stressful to senior pets. The cause of peripheral vestibular disorder in pets may include a middle ear infection, genetic sources, head trauma, an underactive thyroid gland, or a central nervous system issue, like a brain lesion. Often times, however, the exact cause can remain undetermined. How is Vestibular Disorder Diagnosed and Treated? Schedule an appointment for you and your furry friend to visit a veterinarian if you suspect vestibular disorder. Your vet will conduct proper testing, including a physical examination and a neurological assessment, which will determine if the disorder is peripheral or central. If the peripheral form is diagnosed, an otoscope will be used to view the depths of your pet’s ear. Your vet may also conduct additional tests such as x-rays and blood tests to rule out any other possible causes of your pet’s symptoms. Treatment depends on the diagnosis. For example, if an ear infection results in the inflammation of tissues and nerves of the vestibular system, an important part of treatment will be to eliminate the infection. If your pet is diagnosed with the more common peripheral vestibular disorder, your vet will likely prescribe motion sickness medications to alleviate your pet’s nausea and vomiting. Fortunately, this form improves quickly in most cases, once the underlying cause is addressed and symptoms of vertigo are managed with supportive care.